What I see in the first part is who wholly disappointing. It lasts 35 minutes only including ads, and the ads last 8 minutes so do the maths… 419 dey o! In the first part the story barely gets started. It is the typical rich girl meets poor boy and parents in arms Nollywood story. There is nothing at all different here. Chelsea goes beserk threatening to kill herself until the family accepts the relationship *yawn* It is quite a task to get through this movie because it is so booooring. Nadia played by Tonto Dikeh is introduced right at the start of the movie as Chelsea’s sister who lives somewhere abroad. The whole her sending a video to be played for her parents stating how much she missed them and crying like someone was dying and blah blah blah didn’t fit for me. Why introduce that if we get to the end of part one and it isn’t even explored? Nadia then comes back the day after she finds out Chelsea won’t leave her room so why couldn’t she come to visit before that if she really wanted to. Chimooo daddy done finish Jacob! Samuel Ruffy did the soundtrack. The oochy coochy song I thought was wack at first but I actually started liking it after the 3rd play. It had a 90′s RnB feel. Do you remmeber the group Something For the People? It sounded like something that they would have done. I thought that the title was stupid and spelt stupidly. 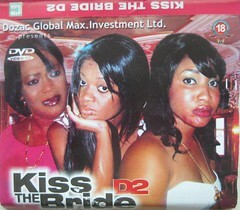 The repackaged title KISS THE BRIDE was even more nonsensical. What bride and who is kissing any bride? Bloody idiots. Salma Mumin who was playing the character Irene was as annoying as she was in Temptation. She was wearing false eyelashes for what? It looked out of place. Looking like a village girl with canerows flat shoes and false lashes? Huh Say What? She also over exaggerated her acting again. Useless actress in a useless movie. Oh lawd. Rubbish waste of time. Tonto Dikeh’s acting was unbearable. I normally like her but the way she was twisting up her words was cringeworthy and she wasn’t believeable. I don’t know if it was just her or the wackness of the script. I couldn’t say. It was just all to the bad. The guy (Jacob) has been working what? A few weeks, a month at most and he has managed to buy a mansion and top of the range car? Yeah right? They didn’t even say the company gave it to him. Put plainly this movie is uninspiring trash. Let me not go on too much lamenting about how crap this movie was. I’m sure you get the point. The story is lame, unoriginal and uninteresting. I would not even recommend it if you were bored. You might have more fun just staring at your walls. Just bin it or swap it with someone you can’t stand. Thumbs down. i watched this movie it was just stupid..reminded me of that movie with richard gere and olivier martinez..soo stupid and useless..aargh! It reminded me of nothing… But rubbish lol. I sat there just shaking my head the whole time. And then the cheek to make it even longer that 2 parts when the two parts already existing made up just over an hour? Liberties! I dont blame you. It is bad. All i can say is – serves you right for buying/watching a movie title honey coochie coochie love! I mean – WHAT? What kind title be that one too. I saw peddlers trying to sell that DVD and I run away in the other direct, lol! My own was called KISS THE BRIDE. So all of you need to watch out for that one too. The name alone is a total turn off. I wont be wasting my money. I don't blame you my dear. Didnt like the movie,fall asleep to be honest.Iexpected it to be better,funnier.A better storyline could have done the job,it was too long for nothing maybe that's why. They could have chose another title though,the title expanded my expectations making me think is gonna be better,more original than it actually is,to be honest a more boring title would have been better for the movie,making me title"for such a basic titl it's a good movi£it would hve been nice,but sorry to say it was the opposite,it feels to me as if ruffy samuel is doing too much for his character,but he don't need to he is got the face,the height already too much don't need to try to be over the top lolu know wat mean,not trying to be rude in any way ooo just saying oo lool. 16 per cent is a just rating for this movie indeed. Thats what i was tryna write . Don't worry you have been forgiven. I agree the movie was boring. In fact very boring and a waste of time.